American military strategic defense satellite. USA 101. 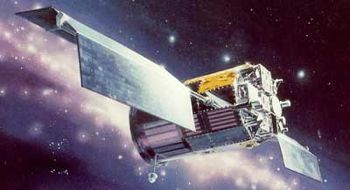 TAOS was a technology demonstration satellite whose purpose was to demonstrate autonomous space navigation systems to reduce satellite ground support needs. AKA: Technology for Autonomous Operational Survivability. Status: Operational 1994. First Launch: 1994-03-13. Last Launch: 1994-03-13. Number: 1 . Gross mass: 502 kg (1,106 lb). Height: 1.73 m (5.67 ft). Lowering the needs for ground support of future spacecraft would increase the survivability of satellites during wartime conditions and reduce satellite operations costs. TAOS also incorporated several new satellite bus components designed to improve reliability and maintainability of future spacecraft while reducing life-cycle costs. TAOS was the first mission flown under the USAF's STEP (Space Test Experiments Platform) program, and was designated STEP Mission 0. The satellite was controlled from Onizuka AFB, Calif. Satellite operations were interrupted on 19 July 1994 when an inertial measurement unit failed. During the following two month period, the satellite's solar panels could not be properly sun-pointed, resulting in a loss of satellite power. Vehicle control was regained following the development of a new satellite control system. The spacecraft was 3-axis stabilized. Two solar arrays with 1-axis articulation provided power. A hydrazine propulsion system was used for orbit maintenance and to desaturate the momentum wheels. An S-Band communications link was made with SGLS RTS stations. A MIL-STD 1553B data bus was used for intra-satellite communications. Two MIL-STD 175OA computers were used for spacecraft control and payload operation. The payload consisted of 10 experiments to investigate technologies applicable to autonomous space operations. The Microcosm Autonomous Navigation System (MANS) used two spinning sensors to provide Earth/Sun/Moon position measurements to determine satellite position and attitude. The system had a goal of 100 meters in position and 0.03 degrees in attitude. A six-channel Global Positioning System (GPS) receiver was used to calculate orbital position to within several meters. The 1553B data bus and MIL-STD 175OA computers were carried as technology demonstrations. The satellite also carried a radar sensor and two laser sensors. Family: Medium earth orbit, Military, Military strategic defense sat. Country: USA. Spacecraft: STEP. Launch Vehicles: Taurus, ARPA Taurus. Launch Sites: Vandenberg, Vandenberg 576E. Agency: USAF, TRW, CTA Space Systems. Bibliography: 2, 279, 6. 1994 July 19 - . TAOS satellite IMU fails - . Nation: USA. Spacecraft: TAOS. TAOS was a technology demonstration satellite whose purpose is to demonstrate autonomous space navigation systems to reduce satellite ground support needs. Satellite operations were interrupted when an inertial measurement unit failed. During the following two month period, the satellite's solar panels could not be properly sun-pointed, resulting in a loss of satellite power. Vehicle control was regained following the development of a new satellite control system.